(Left to right): Soraya Rizek-DePaolo, Receptionist; James McPeak, Owner/Operator; Jennifer Turner, Manager; Suzan Csako, Kitchen Director and Diana Ramon, Kitchen Staff Member, McPeak's Assisted Living. 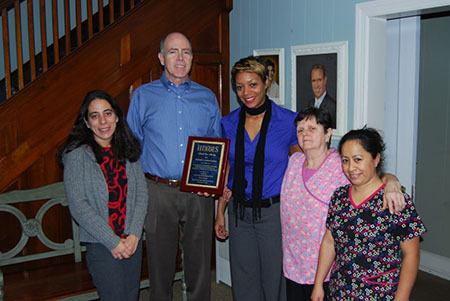 Due to its "outstanding service" and "safe, clean environment," McPeak's Assisted Living was named one of Long Island Business News' "Health Care Heroes" of 2012 in the Assisted Living Facility category. McPeak's Assisted Living was founded in 1956 by two registered nurses, James and Katherine McPeak. The licensed facility is devoted to caring for the elderly and the disabled, while obtaining the most modern safety features and updates. McPeak's Assisted Living offers many amenities run by its efficient and compassionate staff. "The goal of the Health Care Heroes awards is to recognize excellence, promote innovation, contribute to the enhancement of the value and quality of health care and, ultimately, recognize the people and organizations whose tireless work, contributions and dedication to healing and caring ensure the well-being of everyone on Long Island," a representative from LIBN stated. "We're very grateful to be recognized by LIBN as a Health Care Hero this year," said James McPeak, Owner/Operator, McPeak's. "We truly feel quality care at an affordable cost is something of utmost importance to Long Island, particularly in this climate of economic uncertainty and we are proud to be able to offer that to our community."